Nilfisk Central Vacuum Cleaners gives you a number of advantages. E.g. better indoor climate, low noise, and better ergonomic. The Nilfisk models with self-cleaning filter makes it possible for you to use the machine bagless. 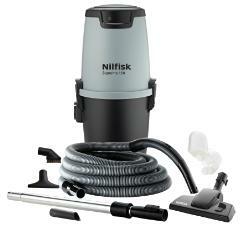 Nilfisk has a broad range of accessories and hoses for central vacuum cleaner. the broad range of parts makes Nilfisk able to meet all your requirements. There are several ways of installing the Nilfisk central vacuum cleaner, to give everyone a discreet and effective cleaning without dust or difficulties. A Central Vacuum Cleaner is a very ergonomic way of cleaning your house. 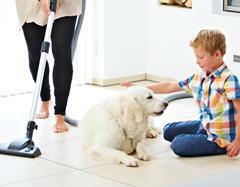 Nilfisk central vacuum cleaners are ideal if there are pets in the home. To give you the best service Nilfisk gives 5 years of motor warranty on all suction units. The models with Liquid-crystal display (LCD) are very easy to use - simply press the on/off button in the bend end to start. To make the installation more convenient, kits are designed to fullfil what is needed for a normal house.